Dental applications of finite element (FE) analysis have grown exponentially in the last decade as a way to assess the mechanical behavior of dental materials, teeth and implants. Finite element analysis is a computer-based method that calculates stresses and strains in computer-aided design models. It does so by splitting complex calculations into a large number of simple equations [1-3]. Software programs used to perform FE analysis are based on models of partial differential equations with boundary conditions. The simplification inherent in FE analysis has several limitations considering the linear simulation of material properties, interrelations and geometries. Nevertheless, these programs enable accurate comparison of models, which approach closer to reality as the calculation power of computers increases [4, 5]. Structural modeling is getting faster with graphical interfaces and tools for computer aided design. The evolution of dental materials, prosthodontics and orthodontics has created a stimulating environment in which to use FE analysis in dental biomechanics. Dental literature involving FE analysis has also grown because of the increase of authors. All around the world, many dental researchers have learned how to use FE analysis software. Indeed the increasing accessibility of informatics has led more countries to compete in the computer-based research. In addition, many other dental researchers have preferred collaborating with FE-skilled people. As a matter of fact, mastering the software can be a long and demanding process. But at the end, all these researchers are authors trying to find out the most relevant journal, and to maximize the impact on their field. Papers involving FE analysis are now very common in dental research, and young researchers may wonder if specialised journals are not overwhelmed by FE studies. Unfortunately to our knowledge, a study providing a longitudinal overview of dental FE-related (DFE) literature does not exist. The aforementioned question prompted us to investigate whether authors and publishers in dental research are still interested by FE papers. This bibliometric study sought to quantify the evolution of the DFE literature during the last decade (from 1999 to 2010) using the SCI-expanded database of Web of Science® (WoS, Thomson Reuters). The data for this study was obtained in November 2011 from the SCI-expanded database of Thomson Scientific Web of ScienceTM (WoS). To retrieve a comprehensive set of DFE literature, all primary articles or reviews published in journals with at least “finite element” and one of the following keywords in the titles/abstracts were included: endodont*, dentist*, dental, periodont*, temporomandibul*, gingiv*, molar, incisor, "alveolar bone", orthodont*, dentin*, enamel, maxillar*, mandibul*, oral, caries, lingual, jaw, "root canal", prosthodont*, denture, premolar, where the asterisk replaces any subsequent string of characters. Data sets were selected, analyzed, and ranked in decreasing order of productivity by country and journal, using Microsoft Excel. Multi-authored publications were assigned equally to each country appearing in the author address field. Finally, publications from England, Wales, Scotland, and Northern Ireland were collectively assigned to the United Kingdom. Dental-related FE literature increased 10-fold faster than the overall scientific literature between 1991 and 2010 (from 12 to 257 papers: 21 fold, and from 689,645 to 1,436,479 papers: 2 fold, respectively). 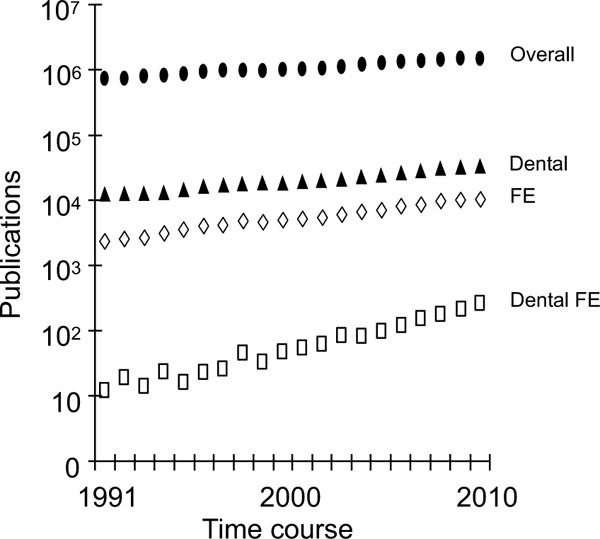 Dental-related FE literature has grown exponentially since 1991, and even faster than the dental literature (which also increased exponentially) during the last decade. The overall scientific literature and FE literature since 1991 increased linearly in time. The first DFE papers appeared in 1973, eight years after the first FE papers. Trends of publication productivity in the scientific literature involving finite element and the field of dentistry during the period 1991-2010. Dental: dental literature, FE: FE literature, DFE: dental literature involving finite elements analysis, Overall: scientific literature. The DFE literature is not the only responsible of the global FE literature increase during the last decade, as DFE literature represents only 2.5% in 2010. The number of DFE publications retrieved and analyzed was 80 in 1999-2000 and 473 in 2009-2010. The percentage of DFE publications that was review articles remained stable between the two time periods (5% each). The percentage of DFE papers written in English grew from 97.5% to 99% in the WoS database over the decade (data not shown). Distribution of DFE papers among countries during the periods 1999-2000 and 2009-2010. (IF: impact factor). Countries publishing DFE research in 1999-2000 and 2009-2010 are displayed in decreasing order according to the number of publications for each time period. The country average of 2010 Impact Factors is mentioned for the 2009-2010 period. A country could belong to the top 10 with only three publications in 1999-2000, whereas 16 publications were needed in 2009-2010. Four countries reached the top 10 for the first time in 2009-2010, and each produced more than 15 publications: Italy (12th in 1999-2000), Brazil (21st), Australia (18th) and South Korea (23rd). They replaced Switzerland, Netherland, Canada and Belgium, which still remained in the new top 20 with more than eight papers each. In terms of impact factor (IF), the world average (calculated as the average of each country’s average) was similar to the average IF of the top 10 countries in 2009-2010 (1.87±1.19 and 1.9±0.3 respectively). Among the top 10, Australia had the highest average IF (2.43) and Turkey the lowest one (1.45), and both published 21 papers. Of the 27 EU countries, 22 published at least one DFE paper in 2009-2010. The five countries that did not publish were Bulgaria, Estonia, Latvia, Luxembourg, and Slovakia. When analyzing the country-to-country collaboration of the top 6 publishing-DFE countries, it appears that USA was the most collaborative country with 45% of its publications, while Brazil only shared 19% of them. China had a mean of 3.22 papers per country collaboration, while Italy shared a total of 7 collaborative papers with 10 countries at the same time. USA was the top 6’s favorite collaborative country (27 publications), with exception for the Japanese who preferred China. Publishing profiles of the top-six most prolific countries (and European Union) involved in DFE research for the 2009-2010 period. The mean IF increased by 75% between 1999-2000 and 2009-2010 for the top 10 journals publishing DFE papers (1.19 and 2.08 respectively), and by 165% when considering only the top 3 journals (0.89 and 2.35). The journal IFs were comprised between 0.565 and 1.9 in 1999-2000, and between 0.772 and 3.291 in 2009-2010. The 3 most publishing journals represented around 45% of the top 10 production at both time-points (21/45 in 1999-2000 and 73/162 in 2009-2010). The number of papers from the 10 most publishing journals increased by 3.6 fold during the decade. Half of 1999-2000 journals remained in the top 10 in 2009-2010, when considering the “Journal of Biomedical Materials Research Part A” as a part of the former “Journal of Biomedical Materials Research” since 2003. Six out of the top 10 journals were published in the USA in both periods. The number of journals involved in the DFE literature increased 3.6 fold during the decade (from 40 journals in 1999-2000 to 144 in 2009-2010; data not shown). Top-ten most prolific journals with DFE research papers and their impact factors (IFs) for 1999-2000 and 2009-2010 peri-ods (IF: impact factor). Five of the journals that published the largest number of DFE papers in 1999-2000 were referenced in the WoS database as specialized in “Dentistry, Oral Surgery & Medicine” in comparison to four in 2009-2010; in addition, two belonged to another category (versus three in 2009-2010). It is noteworthy that the two journals on medical materials have been replaced by two on dental materials. The most represented articles were “Dentistry, Oral Surgery & Medicine” (59% in 1999-2000, 56% in 2009-2010), “Engineering, Biomedical” (27% and 21% respectively) and “Materials Science” (14% and 17% respectively) [data not shown]. A minority of papers was referenced in 2 categories at the same time. The results of this bibliometric study showed that FE literature in dental research generates increasing interest from scientific authors and publishers around the world. The evidence is that the volume of DFE publications increased exceptionally fast (Fig. 1), the number of countries involved in authorship doubled the last decade (Table 1), collaborations are frequent (Table 2), and the mean impact factor of the top 10-publishing journals rose by 75% (Table 3). Software and its availability on personal computers has supported the increase of the DFE authors. The second finding, that the number of countries involved in DFE authorship grew substantially from 24 to 54 in one decade (Table 1), also supports the idea of an increasing community. Nearly half of these countries in 2009-2010 published at least five papers, showing that the country contribution is not accidental or isolated. Furthermore, the fact that the USA, the country that published the most DFE papers, collaborated on 45% of its publications in 2009-2010 confirms that the DFE field is expanding across national frontiers (Table 2). A hypothesis for this high level of collaboration may be that clinical researchers can ask for help from researchers skilled in DFE who do not necessarily live nearby. Finally, we showed that the impact factor of journals publishing DFE studies has increased the last decade, evidence that DFE studies were likely cited by peers, and consequently of interest for editors and publishers. With the global trend described in science and technology . Second, the emergence of South Korea in the top 10 (from 23th in 1999-2000 to 10th in 2009-2010) and the increased leadership of China (including Taiwan, from 6th to 2nd) were also noted in different fields of research [8-11]. Indeed these countries are driven by a strong economic growth and invest massively in research competition. Third, we also found that EU share of total publications was greater than the USA’s at both time periods. However this observation was also made by Albarran (2010) , who interestingly added that USA publications were still more cited than EU’s. Africa remained under represented in 2009-2010, consistently with other bibliometric studies [8, 10, 13]. The only African countries to be reported were Egypt (ranking 22, 5 papers), Algeria and South Africa (ranking 31 ex aequo with 2 papers; Table 1). “Dentistry” and “material science” journals support the interest for DFE literature. Our results suggest that journals publishing DFE literature were related with implant biomechanics (such as dental materials, prosthodontics and orthodontics) (Table 3). The International Journal of Oral & Maxillofacial Implants was the most publishing journal of DFE studies in 2009-2010, with 35 papers (Table 3) which represented 8% of its publications. This journal was already ranking second in 1999-2000 with 6 papers. Its most cited DFE papers were in 2001 a review article with 7 citations  and in 2011 an original research article with 16 citations . In 10 years, its IF increased by an average of 2.5% per year, which is similar to the average rate of 2.6% per year described for all journals listed in the Thomson Scientific Journal Citation Reports (Science and Social Science editions for the years 1994-2005) . This natural IF increase has been shown to be mainly due to the increase of references listings in all papers over the years . An explanation to this stabilized situation may be that articles about dentistry were hardly exportable to journals outside the disciplinary field, limiting the expansion of dental journals through scientific impact metrics . As these indexes tend to determine the quality not only of papers and journals, but researchers as well , authors tried to publish outside the strictly dentistry field. This trend led to an IF increase of DFE literature and the diversification of WoS categories (Biophysics; surgery; engineering, biomedical, Table 3). Interestingly, most of the journals in the 1999-2000 ranking were either considered as “Dentistry” or “Material science”. However, a new and promising WoS category of journal emerged in the top 10 ranking of 1999-2000, combining both “Dentistry” and “Materials science” (“Dental Materials” created in 1984 and “Dental Materials Journal” in 1981). These highly specialized journals may contain the new audience of DFE papers. Dental-related FE papers are not “classic” citations yet. The DFE papers represented 0.22% of the dental literature in 1999-2000, and only 0.72% ten years later. Interestingly, the percentage of papers mentioning “finite element” in their title remain 36%. This could mean that the same proportion of studies were pure FE studies, as opposed to those performing FE analysis among other methods to achieve their demonstration. In studies analysing the top 55 cited-papers in periodontology  (2007) and top 100 in endodontics  (2011), DFE papers were not yet part of the “classic articles”. However in these previously studied journals, some DFE papers can reach more than 30 citations in periodontology [21-23] and more than 60 in endodontics [24-26]. In a selected panel of orthodontic journals, only one paper  (published in 1987) was part of the 2013 top 100 . Even in the implantology and prosthodontics fields, DFE papers still represent less than 4% of the top 100 (data not shown). The period covered by this bibliometric study is a limitation. First, the Science Citation Index (SCI) Expanded® has coverage only since 1991 for 70% of the articles of full-length, English-language, author, abstracts, (http://images.webofknowledge.com/WOK45/help/WOS/h_database.html). The 1991 improvement of the coverage was associated with a sudden 2.7 fold increase for dental literature in the WoS database between 1990 and 1991 (data not shown). However, the SCI-Expanded provides complete bibliographical information over 8,500 major international journals across 150 disciplines, dating back to 1900. Second, some journals are referenced later than others, and IF are released six months after the year of publication. As a consequence, we could not analyse accurately publications retrieved from the last couple of years. Third, in order to have bigger numbers of publication, we studied publications retrieved from periods of a couple years. As these represented a lot of manual analyses, we did not compare more than two periods. Anyway, we do believe that our assumptions were reasonable as trends in DFE publications evolved exponentially with predictability (Fig. 1). In conclusion, the results of this bibliometric study showed that FE literature in dental research generates an increasing interest from authors and publishers around the world. The evidences are that the volume of DFE publications increased exceptionally fast, the number of countries involved in authorship doubled the last decade, collaborations are frequent, and the number of publishing journals increased while the mean impact factor of the top 10 publishing journals arose by 75%. It is hoped that the present study showing the richness, importance, and diversity of DFE research provides a useful description of the scientific literature and will encourage researchers to further advance this field. The authors wish to thank Charles-Daniel Arreto and Claude Robert (Paris Descartes University, France) for having performed the bibliometric processing, N. Dorin Ruse (University of British Columbia, Canada) for the finite element discussions, and the three of them for being so helpful and collaborative on this project. Courant R. Variational methods for the solution of problems of equilibrium and vibrations. Bull Am Math Soc 1943; 49: 1-24. Clough RW. The finite element method in plane stress analysis. PA: Pittsburg 1960. Babuška I, Aziz AK. Survey lectures on the mathematical foundations of the finite element method. In: Aziz AK, Ed. The mathematical foundations of the finite element method with applications to partial differential equations. New York: Academic Press 1972; pp. 3-359. Wakabayashi N, Ona M, Suzuki T, Igarashi Y. Nonlinear finite element analyses: advances and challenges in dental applications. J Dent 2008; 36(7): 463-71. Kelly JR, Benetti P, Rungruanganunt P, Bona AD. The slippery slope: critical perspectives on in vitro research methodologies. Dent Mater 2012; 28(1): 41-51. Glanzel W, Schubert A, Braun T. A relational charting approach to the world of basic research in twelve science fields at the end of the second millennium. Scientometrics 2002; 55: 335-48. Shelton RD, Foland P. The race for world leadership of science and technology: Status and forecasts. In: Larson B, Leta J, Eds. Proceedings at the 12th International Conference on Scientometrics and Informetrics. Rio de Janeiro 2009; pp. 369-80. Robert C, Wilson CS, Gaudy JF, Arreto CD. The evolution of the sleep science literature over 30 years: A bibliometric analysis. Scientometrics 2007; 73: 231-56. Vergidis PI, Karavasiou AI, Paraschakis K, Bliziotis IA, Falagas ME. Bibliometric analysis of global trends for research productivity in microbiology. Eur J Clin Microbiol Infect Dis 2005; 24(5): 342-6. Rosmarakis ES, Vergidis PI, Soteriades ES, Paraschakis K, Papastamataki PA, Falagas ME. Estimates of global production in cardiovascular diseases research. Int J Cardiol 2005; 100(3): 443-9. Cimmino MA, Maio T, Ugolini D, Borasi F, Mela GS. Trends in otolaryngology research during the period 1995-2000: a bibliometric approach. Otolaryngol Head Neck Surg 2005; 132(2): 295-302. Albarran P, Crespo JA, Ortuno I, Ruiz-Castillo J. A comparison of the scientific performance of the us and the european union at the turn of the 21st century. Scientometrics 2010; 85: 329-44. Robert C, Wilson CS, Gaudy JF, Hornebeck W, Arreto CD. Trends in matrix metalloproteinase research from 1986-2007: a bibliometric study. Biochem Cell Biol 2010; 88(5): 843-51. Brunski JB, Puleo DA, Nanci A. Biomaterials and biomechanics of oral and maxillofacial implants: current status and future developments. Int J Oral Maxillofac Implants 2000; 15(1): 15-46. Motoyoshi M, Inaba M, Ono A, Ueno S, Shimizu N. The effect of cortical bone thickness on the stability of orthodontic mini-implants and on the stress distribution in surrounding bone. Int J Oral Maxillofac Surg 2009; 38(1): 13-8. Althouse BM, West JD, Bergstrom CT, Bergstrom T. Differences in impact factor across fields and over time. J Am Soc Info Sci Technol 2009; 27-34. Sillet A, Katsahian S, Rangé H, Czernichow S, Bouchard P. The Eigenfactor™ Score in highly specific medical fields: the dental model. J Dent Res 2012; 91(4): 329-33. Opthof T. Sense and nonsense about the impact factor. Cardiovasc Res 1997; 33(1): 1-7. Nieri M, Saletta D, Guidi L, et al. Citation classics in periodontology: a controlled study. J Clin Periodontol 2007; 34(4): 349-58. Fardi A, Kodonas K, Gogos C, Economides N. Top-cited articles in endodontic journals. J Endod 2011; 37(9): 1183-90. Atieh MA, Ibrahim HM, Atieh AH. Platform switching for marginal bone preservation around dental implants: a systematic review and meta-analysis. J Periodontol 2010; 81(10): 1350-66. Wennström J, Zurdo J, Karlsson S, Ekestubbe A, Gröndahl K, Lindhe J. Bone level change at implant-supported fixed partial dentures with and without cantilever extension after 5 years in function. J Clin Periodontol 2004; 31(12): 1077-83. Magne P, Belser UC. Porcelain versus composite inlays/onlays: effects of mechanical loads on stress distribution, adhesion, and crown flexure. Int J Periodontics Restorative Dent 2003; 23(6): 543-55. Berutti E, Chiandussi G, Gaviglio I, Ibba A. Comparative analysis of torsional and bending stresses in two mathematical models of nickel-titanium rotary instruments: ProTaper versus ProFile. J Endod 2003; 29(1): 15-9. Xu X, Eng M, Zheng Y, Eng D. Comparative study of torsional and bending properties for six models of nickel-titanium root canal instruments with different cross-sections. J Endod 2006; 32(4): 372-5. Tay FR, Pashley DH. Monoblocks in root canals: a hypothetical or a tangible goal. J Endod 2007; 33(4): 391-8. Tanne K, Sakuda M, Burstone CJ. Three-dimensional finite element analysis for stress in the periodontal tissue by orthodontic forces. Am J Orthod Dentofacial Orthop 1987; 92(6): 499-505. Hui J, Han Z, Geng G, Yan W, Shao P. The 100 top-cited articles in orthodontics from 1975 to 2011. Angle Orthod 2013; 83(3): 491-9.